Not My Typewriter: "You will break your neck on that monument some day." "You will break your neck on that monument some day." Today marks the 200th anniversary of Sir John A. Macdonald's birth. 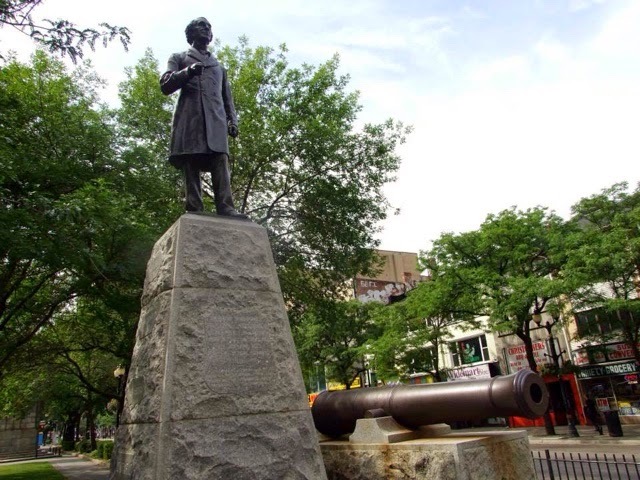 Two years after he died in 1891, the larger-than-life bronze statue that stands in Gore Park was unveiled, having been shipped from London, England to Hamilton. The statue itself is eight-feet-three-inches, but with the addition of the granite pedestal, it stands at more than nineteen feet. 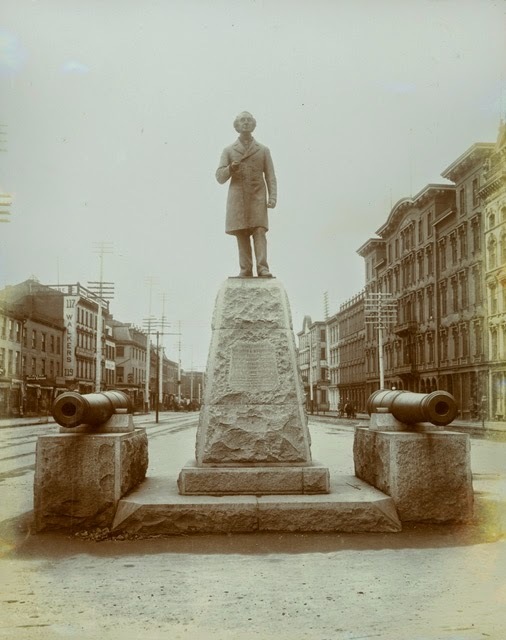 According to the Hamilton Public Library, the statue's dedication ceremony in November 1893 "brought together many dignitaries including the current Prime Minister, Sir John Thompson. Over twenty thousand onlookers were in attendance for the unveiling. The ceremony was held and the statue was unveiled by Sir John Thompson through the use of an electric button which released the veil. The crowds reportedly cheered as the 13th Battalion band played 'Hail to the Chief'." However, the most interesting part of this ceremony is where it took place. It took place where the statue originally stood, at the intersection of King and Hughson Streets. I pass the Macdonald statue, where it stands today in Gore Park, nearly every day en route to work. But since a Hamilton Cemetery tour with Historian Robin McKee a few years ago, I don't think of John A. Macdonald as I pass, rather, I think of a story about a fire chief who died more than 100 years ago. On April 5, 1905, Hamilton's first full-time fire chief, Alexander Aitchinson, was racing toward a small grass fire when, according to Margaret Houghton's book The Hamiltonian's: 100 Fascinating Lives, "his buggy collided with the chemical wagon at the corner of King and Hughson Streets." Aitchinson was thrown from his buggy, colliding with, of all things, the base of the Macdonald statue. He died later in hospital. Before and after this accident, Hamiltonians debated whether a statue in the middle of this intersection was safe. In his book Their Last Alarm, Robert Kirkpatrick writes, "When the Sir John A. Macdonald monument was erected citizens had objected, stating that its location would be dangerous. Two reporters quoted Chief Aitchison as saying 'You will break your neck on that monument some day.'" In 1907, the John A. Macdonald statue was removed from the intersection of King and Hughson, arriving in its new home, where it still stands today, in Gore Park. Former location of the Macdonald statue.